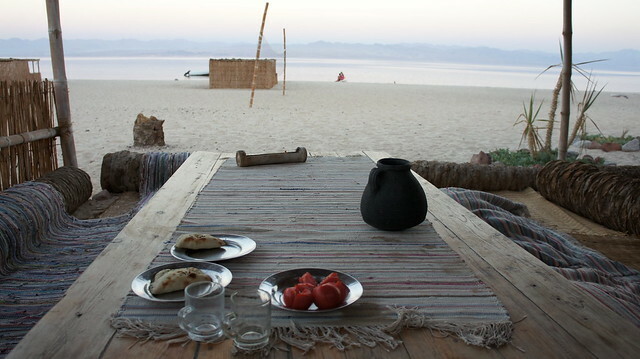 There is a remote place in Egypt’s beautiful Sinai peninsula that seems an example of symbiotic co-existence of nature’s simplicity and human innovation. Not without a reason it is called Basata in Arabic meaning both – happiness and simplicity. 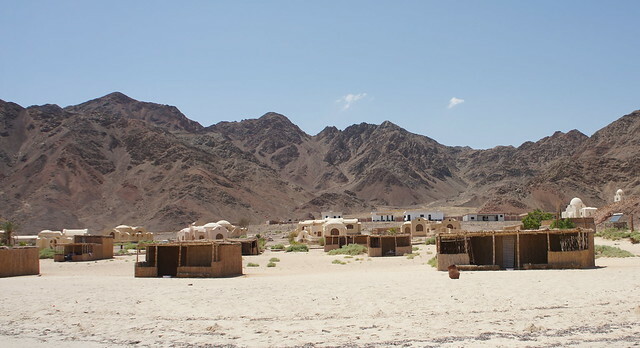 Mountains, desert and the Red Sea are surrounding a dozen of bamboo huts and clay chalets. It is claimed as one of the best beaches in the world. The water next to the coast in summer is as warm as in your bathtub. While swimming or snorkeling next to a coral rife with enjoy a company of colourful fish and when stepping out of the water, be careful not to touch a sand coloured crab who is escaping from you and burring himself a hole. Basata camp is an ecolodge – a place where owners and guests are taking care of natural resources, using solar energy and recycling waste. It is a family enterprise and a community built on mutual respect and trust. 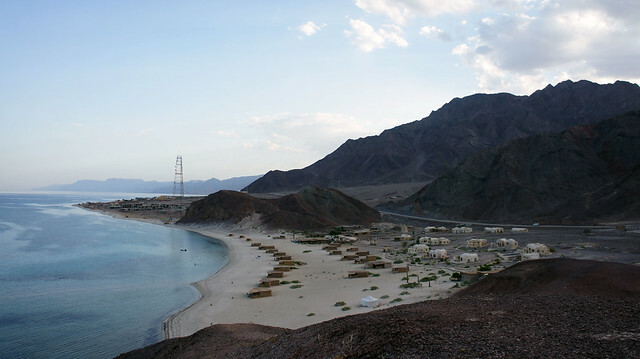 Located between Nuweiba and Taba in South Sinai and being almost 500km from Cairo, getting there is an adventure itself so only the most committed and determined come. It is a place to reconnect with the nature and reflect. Basata story starts 30 years ago when a young civil engineer from Cairo Sherif El Ghamrawy decided to break his daily routine and define the real priorities in life – nature, health, happiness and self-fulfillment. Sherif acknowledged that as a beginner engineer he had some money and had started to gain some reputation. However, he was not happy and was suffering from Cairo’s pollution. He defied all the expectations of a prescribed successful engineering carrier Egypt and decided to start his own project in Sinai. 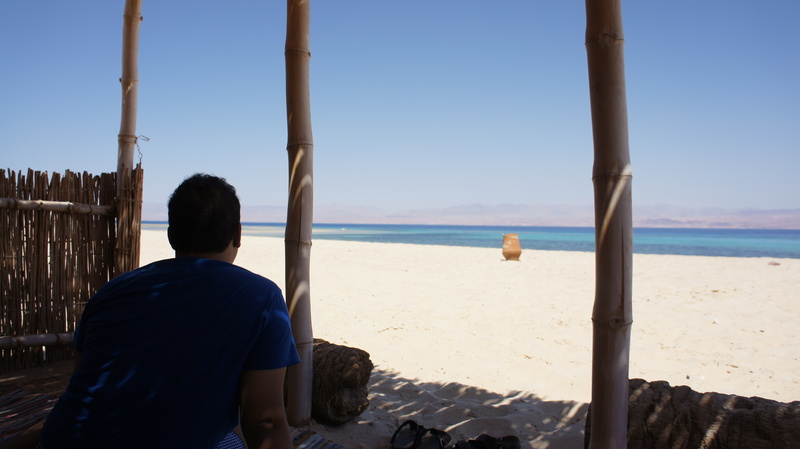 At that time time where there was only one hotel on the whole Red Sea area. 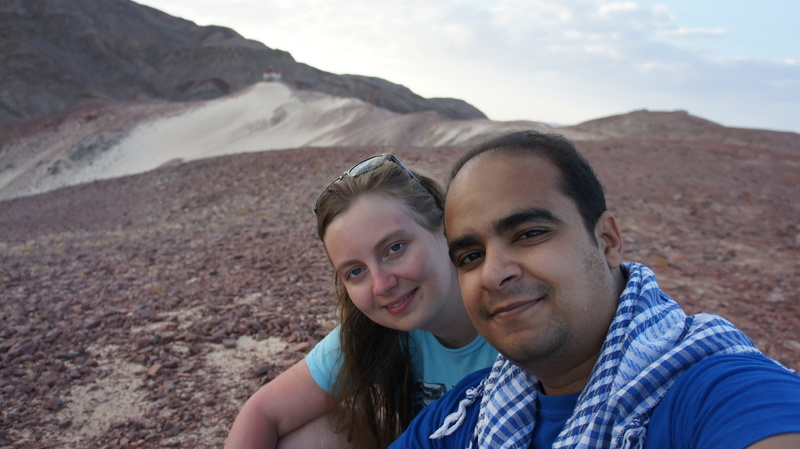 “I took a decision to emigrate from Egypt (Cairo) to Egypt,” he says. Taking this decision was the easiest part, the real struggle had yet to begin. It took four years of bureaucratic ping-pong with local and national authorities to get the license and all the paperwork done. With a bit of luck, he managed to get the approval when the new government has just been installed. But that was not the last step. With the outset of the building works, he started receiving threats from the local Bedouin leaders. He was still considered an outsider, ‘a stranger from Cairo’ wanting to bring tourists without considering the local sensibilities. In the end he managed to get an agreement with them as well and now he is proudly wearing a traditional Bedouin gown while chatting with his guests at dinner time in Basata. He has a great sense of empathy and always finds a common language. After a couple of years managing the camp, Sherif got married to a German women Maria Wuerfel who shared his dreams and priorities. The first four years of their married life, they lived in a bamboo hut on the beach, the last two of which – with their firstborn daughter. “They truly where the happiest years of my life,” says Sherif. The first time I went to Basata I could not imagine such a place exists in an overcrowded, polluted and commercialized Egypt. But Sherif made me think of Egypt beyond Cairo and usual Red Sea tourist spots. I could feel the peace of Latvian forest there. Even Latvian Ambassador Iveta Šulca has visited Basata to discuss EU funding for Egypt’s development. Each time we are getting back to the camp, I am driven to reconsider my own choices and priorities. What is my daily routine? What do I need for a general feeling of happiness and self-fulfillment? After years of searching for the meaning I am now looking for peace and a stable ground under my feet. I want to be able to create and feel appreciated. I want to express and challenge myself and believes and convictions of others in a meaningful discussion. I am eager to fulfill my ambitions and dreams. I want my ‘work’ to be an integral part of my personality. I want a balance between routine, restriction and creativity. I want to feel close to the nature, of course. I want to walk on the streets undisturbed and be able to find an escape to a forest when I wish and need it. I want to have a garden and eat healthy. I have been looking for the right country and place to have it all and hope I have found it now in UK. While part of me will stay forever in Egypt and Latvia, I have to admit nothing happens without compromises. On the cliffs surrounding Basata. Categories: Blog, In English | Tags: Basata, camp, community, dream, Egypt, fulfilment, happiness, Maria Werfel, nature, place, Red Sea, Sherif El Ghamrawy, Sinai, snorkelling, South Sinai, swimming, travel, work | Permalink.